To claim this profile, please confirm you are Sam Mckeithen. To follow this profile, please let us know your relationship to Sam Mckeithen. Sam had 1 photo tagged from the game against Pinecrest. Sam's lacrosse stats have been updated for the loss vs. Pinecrest. Sam's lacrosse stats have been updated for the win vs. Camden Catholic. Sam's lacrosse stats have been updated for the loss @ Athens Drive. Sam's lacrosse stats have been updated for the loss @ Panther Creek. Sam's lacrosse stats have been updated for the win @ Cary. Sam's lacrosse stats have been updated for the win @ Riverside-Durham. 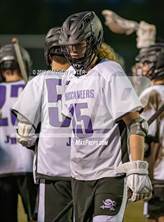 The Jack Britt varsity lacrosse team won Tuesday's away conference game against Riverside-Durham (Durham, NC) by a score of 20-7.